It’s been busy around here lately. Cleaning and getting rid of stuff. Every year our development has a community yard sale and last weekend was it. Last year was the first time I participated in several years. Too much work for very little return. Last year Mr. Aitch and I hauled all our leftover stuff/junk to the basement where it sat all winter. My neighbor asked me if I wanted her to add my things to hers and she would take care of the setting up and selling. I told her to keep any money from my sales. Not a great day for an outside yard sale. The weather consisted of clouds, sun, sprinkles, thunder, rain, and humidity. Lots of humidity. 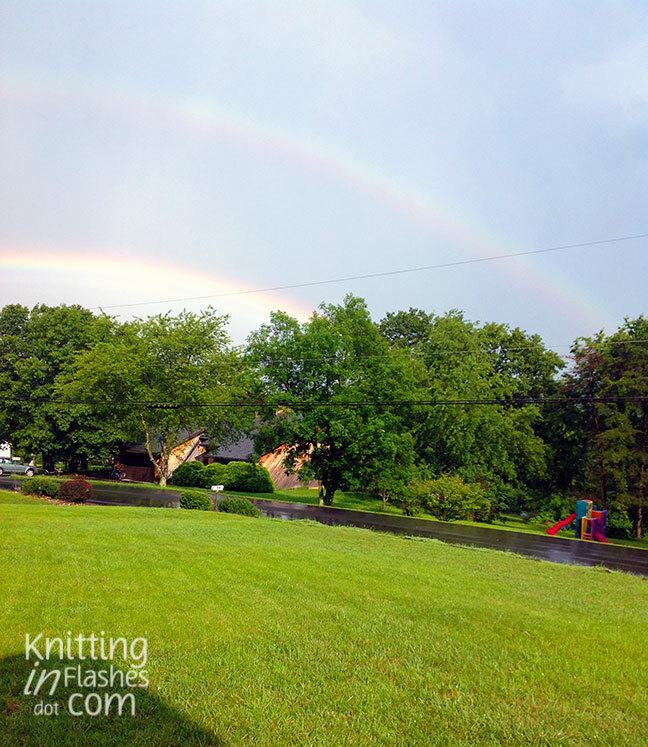 Late in the afternoon another thunderstorm rolled through and left us not one but a double rainbow! Not a bad photo using my iPad! The colors did get more brilliant but the top one disappeared. Did you know the colors are inverted in the top double rainbow? This entry was posted in photography and tagged nature, photography by Patti_is_knittinginflashes. Bookmark the permalink. There right people just don’t come to yard sales any more. I think the consignment shops and thrift stores do a great business. At least the stuff is out of the basement now! I didn’t know that about a double rainbow. I thought my eyes were playing tricks on me but I kept looking at the colors and realized the upper rainbow was indeed reversed. Scientifically it has to do with refraction and reflection but to me it’s just God’s way of showing us His amazing creations. nice neighbor! That’s $12 you can spend on yarn, lol.